We’ve done it, we’ve got a premises licence for the brewery. From Friday 9th September onwards the brewery bar will be open every Friday from 4pm to 10:30pm and every Saturday from noon until 10:30pm for anyone to walk into the brewery and have anything from a third to a few pints of whatever we’ve put on the bar. We’ll also be able to do off-sales direct to the public every weekday too (except Thursdays when we’re out delivering), which means we’ll finally be able to sell you all casks or cases of beer for your parties or just a few bottles for those boring mid-week nights in. What we didn’t expect was that we’d be the first brewery in Manchester to do this! Before Beer Nouveau was a thing, just over two years ago, I started converting our garage at home into a homebrew space with the idea of putting in a small bar, some chairs, maybe a dart board, but generally turning it into a private brew pub that our friends could come around to at weekends in the summer and relax over a few beers, maybe even have a brewday to help keep stocks up. The problem was, we went commercial, and got very busy. 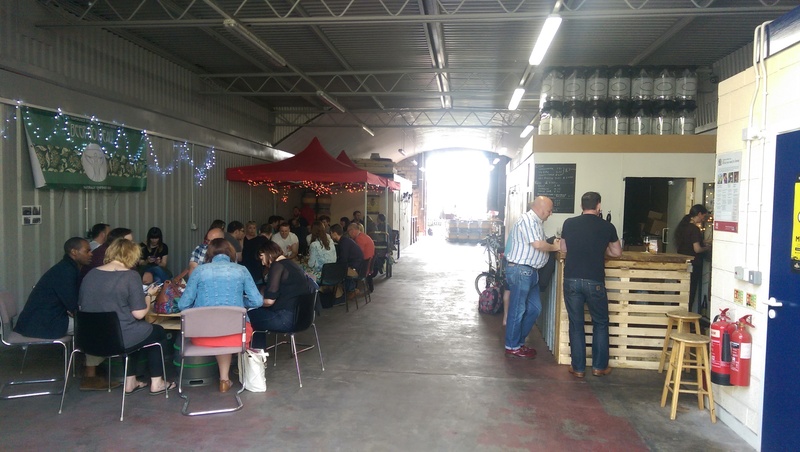 We couldn’t meet demand for bottles, the space for chairs and tables was taken up by extra fermenters and what was going to become the bar became another brew-bench filled with mash tuns and boilers. The idea of having somewhere we could sit with friends and drink some unusual or experimental beers was put on hold, seemingly indefinitely. 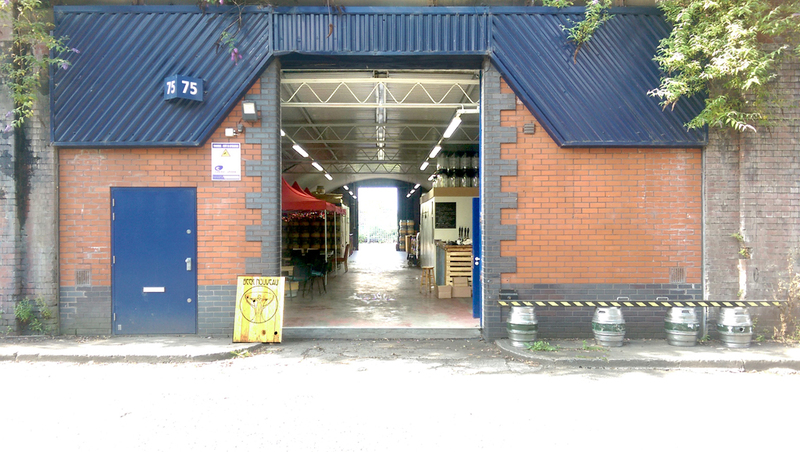 But then we expanded into a railway arch on Temperance Street and had space for a proper bar with hand pulls and a keg line, and we were able to open the brewery up to the public so anyone could come along and try our beers. In May this year Cave Direct, who we shared the arch with, moved out and we suddenly had a much bigger premises. So we built a new bar with more space for seating inside, out of the Mancunian Summer Rain, and while to us serving drinks behind the counter it seemed quieter, it’s been an illusion caused by the amount of space we now have . Each brewery tap we’ve done has seen more people coming along, with new faces each time as well as some of our regulars. Since our first event in October 2015 we’ve made many new friends who we can relax with, chatting about beer and all other sorts of nonsense. But it had to stop. Using temporary event notices for monthly brewery taps had been great, but we decided they weren’t practical. Too many people wanted to come and visit the brewery, but had other commitments on the days that we were open. The only way we saw of practically taking the brewery tap forward was to open it every weekend. A few years ago we were lucky enough to have the opportunity to visit some friends in California. Mrs Beer Nouveau had just been made redundant, and we decided to spend the money on a long-needed holiday. Our friends made sure to take us to visit some brewery taps over there, Bear Republic, Russian River, Stump Town and others. These places were great, the beer was as fresh and well looked after as you could hope for, and there were usually beers on tap that never made it out of the brewery, another reason for going straight to the source. They were usually quite large – breweries in the States are usually large compared to the UK ones – but there wasn’t a factory feel to them, they were more like bars that happened to have windows through to the brewing vessels so you could sit and watch the brewers at work while you were drinking their beers. This was something I’ve missed in the UK recently. Even back in Peterborough with the Oakham Ales brewery tap, it was rare that you actually saw the equipment in use; stuck behind a big glass wall with the main lights off, it was more a showpiece than a working brewery. But the UK used to have a lot of these places, of which the Firkin chain and Mash & Air were probably the best known. Two years ago we got a small amount of inheritance when my brother died unexpectedly of cancer at the age of 40. We decided that life was too short to not spend the money on something we both wanted, so we took a trip to New Zealand. We hired a camper van and drove around both islands visiting brewery taps. The taps in New Zealand were different from those in the UK and in the States, they were more open, laid back, and in a way cobbled together, less slick, less like a lot of money had been spent in one go fitting them out, more… organic. They weren’t usually purpose-built bars next to or near the brewery, they were bars *in* the brewery. You’d walk in, get a pint from the brewery staff working the bar, chat away to them and other regulars about the brewery, the beers, and anything else you fancied. They were great. The closest thing we had to these back here was the wonderful BlackJack brewery tap. But these taps in New Zealand were open all the time, as bars, rather than being very special events once a month. We loved the brewery taps in both the States and New Zealand, and we wanted Beer Nouveau to have one. Initially it’s what we wanted in our garage, but now we’re got one in a large railway arch in Manchester, the best city for beer. So come on over to the brewery any weekend, have a few drinks in the brewery, served by us, the people who make the beer.